We carry good quality locks at wholesale price. These locks comes in different sizes and includes combination locks, padlocks and long shank brass padlocks. Locks have been bestsellers at convenience stores, gas stations and dollar stores. Minimum quantity for "2 PC Brass Padlock 1 PC" is 12. 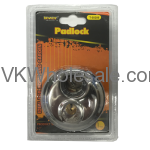 Minimum quantity for "2.7" Round Padlock 1 PC" is 1. 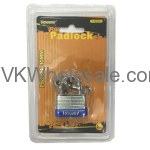 Minimum quantity for "30MM Padlock 1 PC" is 12. Minimum quantity for "40MM Brass Padlock 1 PC" is 12. 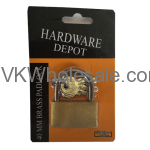 Minimum quantity for "Brass Padlock 25MM / 30MM / 35MM Card Display" is 1. 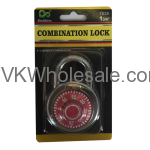 Minimum quantity for "Combination Lock 2" 50mm 1 PC" is 12. 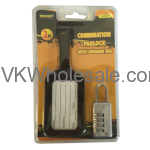 Minimum quantity for "Combination Padlock with Luggage Tag 1 PC" is 12. 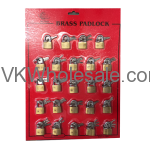 Minimum quantity for "Small Brass Padlock Display Card 20mm 24 PC" is 1.